Please note, all library services close 15 minutes before the building closes. 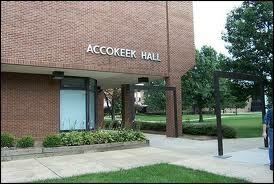 The PGCC Library is located on the first and second floors of Accokeek Hall. General library policies include respect for the scholarly environment and respect from users. All users are expected to maintain a level of quiet study throughout the building. Food and beverages are allowed only in Café Accokeek (opposite the Circulation Services Desk). Prince George’s Community College Library serves residents of the county as well as the students and employees of the college. The library is open to everyone! If you are a resident of the county you may secure a library card at the Circulation Services Desk. A state issued ID is required to verify your residency. There are restrictions on what can be borrowed. Additionally, off-campus access to the research databases and e-books is restricted to students and employees. However, county residents are welcome to use these services when in the Prince George's Community College Library. Prince George's Community College Library provides services and assistance six days a week (fall and spring).